For parents looking for a classic, never-goes-out-of-style sleepwear option, boys' plaid pajamas are a great buy. Pajama sets come in a wide price range and choice of materials. Little boys may be just as comfortable sleeping in a tee shirt and boxer shorts, but having a nice set of pajamas on hand is always a good idea. Plaid pajamas are a wonderful year-round option, although the red and green combo will be more popular as holiday pajama choices. For boys who want to be just like Dad, it's usually easy to find plaid pajamas for boys as well as grown men. All the "boys" in your house can wear matching sleepwear. Some pajama sets feature an accompanying tee shirt, which can be worn during cooler weather and put away when it's warm. Sometimes, boys want to create their own sleepwear; this is a case where buying plaid sleep bottoms sold as separates works well. Look into shops such as Gap Kids or Old Navy for an affordable supply of plaid pajama bottoms that a boy can either wear alone or topped with a comfortable shirt. He probably won't give much thought to good accessorizing; boys are more likely to just grab whatever's clean, and go. Parents can always provide accompanying sleep shirts in coordinating colors if they feel so inclined, but old tees tend to be just as welcome. Sleep bottoms come in a range of colors, such as the most common ones above, but sometimes feature other combos such as grey and white or orange and grey. Most kids will tell you that they absolutely do not want pajamas, or any clothing, as gifts, whether for a birthday or Christmas. Even if you have a boy who would rather do anything else than go shopping, taking him along to choose his own pajamas will ensure that he gets something he likes and is therefore more likely to wear. 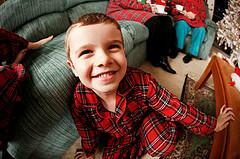 Traditional, button-up plaid pajamas for boys are usually available beginning in the toddler sizes and go up from there. Whether he wants to be just like Dad or prefers more versatility in wearing sleep bottoms instead of a full set, plaid pajamas are one sleepwear item that comes in so many colors and styles, parents and boys have a lot of options, at least one of which is sure to satisfy.